With car insurance mandatory in almost every state, you would hope that fairness in insurance pricing would be a given. You’d be surprised and a 2007 law made it legal for insurance companies to increase your premiums based on something completely unrelated to your driving record. If you haven’t heard about your auto insurance credit score, listen up because drivers caught in this trap pay almost double the premiums versus other drivers. What is an Auto Insurance Credit Score? The auto insurance credit score, also called credit-based insurance score, is a number used by insurance companies and based partly on your credit report. You heard right, your credit report. The report of your payment history and debt is used as a factor to determine your car insurance premiums. 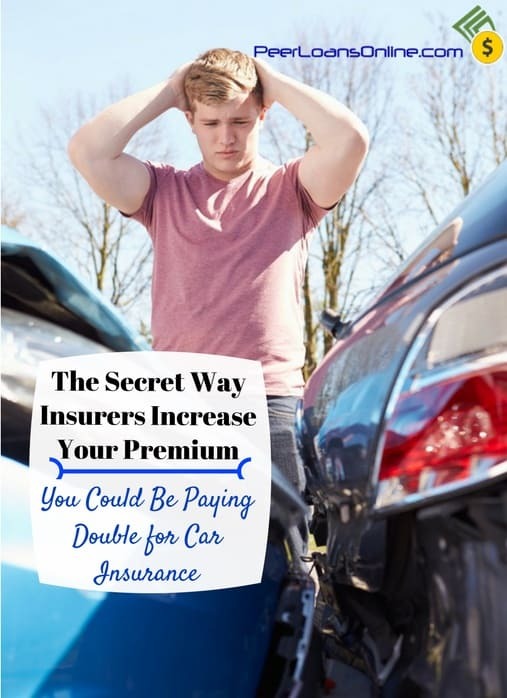 Your auto insurance credit score is not the same as your FICO score, has nothing to do with your driving record but could cause your premiums to double. The National Conference of Insurance Legislators (NCOIL) Model Act of 2007 allows insurance companies to pull your credit report and use it as a factor in premiums. Which Insurance Companies Use My Auto Insurance Credit Score? Most of the largest car insurance companies use the credit-based insurance score including Progressive, State Farm and USAA. Each company calculates the score a little differently but it will be basically the same because it’s based on your credit report. How Does My Credit-Based Insurance Score Affect Premiums? Most of your car insurance premium is going to be based on your driving history. In fact, the NCOIL Act prohibits insurers from basing your premiums solely on your credit report. But your credit score does play a factor and industry data shows people with bad credit pay an average of 91% higher premiums than other drivers. The law also forbids insurers from changing your premiums based solely on a change in your credit report. That doesn’t mean they can’t wait until your driving history changes just a little and then hit you with a huge premium increase based on your now-lower credit score. Your credit score isn’t used to predict whether you’ll pay your premiums. Insurance companies point to a 2007 study by the Federal Trade Commission (FTC) that found credit-based insurance scoring did predict the risk that someone would file a claim. The idea is that people more likely to file a claim should pay higher premiums because they are higher risk. Simply put, a bad credit score will mean you pay more for car insurance. Is the Auto Insurance Credit Score Fair? You have an entire group of Americans paying nearly double the premiums based on something completely unrelated to their driving history…does that seem fair? Whether these drivers are more likely to file a claim may be beside the point. The auto insurance credit score disproportionately falls on poor and minority communities. The fact that car insurance is mandatory in every state except New Hampshire means there is little chance you’re going to get away from it. The only option besides not driving is to improve your credit score. Fair or not, credit-based auto insurance scoring is allowed but not every insurance company uses it. While shopping for car insurance, make sure you ask the representative if they use credit reports to determine premiums. Of course, don’t base your decision solely on whether the car insurance company will use your credit report for scoring. Some of the larger companies may be able to offer lower premium quotes even after accounting for less than stellar credit. If you’re worried that your bad credit may be getting in the way, check out some of the smaller, regional insurance companies. Higher insurance premiums are just one of the things you’ll suffer from bad credit. Check out this post for the 5 things you can’t do with bad credit. You may be able to use the auto insurance credit score to your favor. Work on improving your credit score and it could translate into premium savings later on down the road. Don’t forget that your premiums are still mostly based on your driving record so give your driving history time to clean itself up while you fix your credit.